This is the panel in continuation of the last panel I showed you guys. 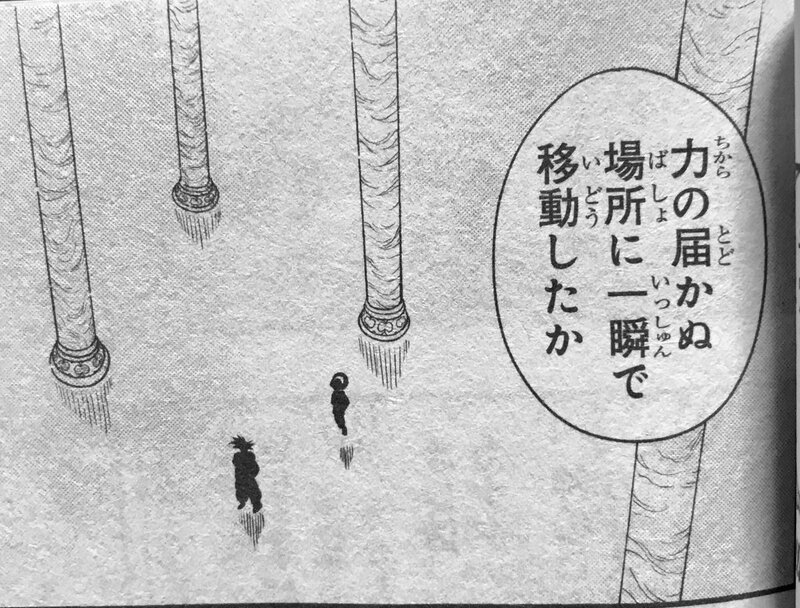 In this panel, we see the silhouettes of Goku and the Grand Priest. The text bubble belongs to Whis who is wondering if Goku moved in an instant (teleported) to a place their powers can’t reach. It is very possible that while Whis was looking for Goku, he might have overlooked the fact that he could be with his father, the Grand Priest. I mean, I never expected this. In this panel, the Grand Priest says, “It looks like you’ve regained enough power. 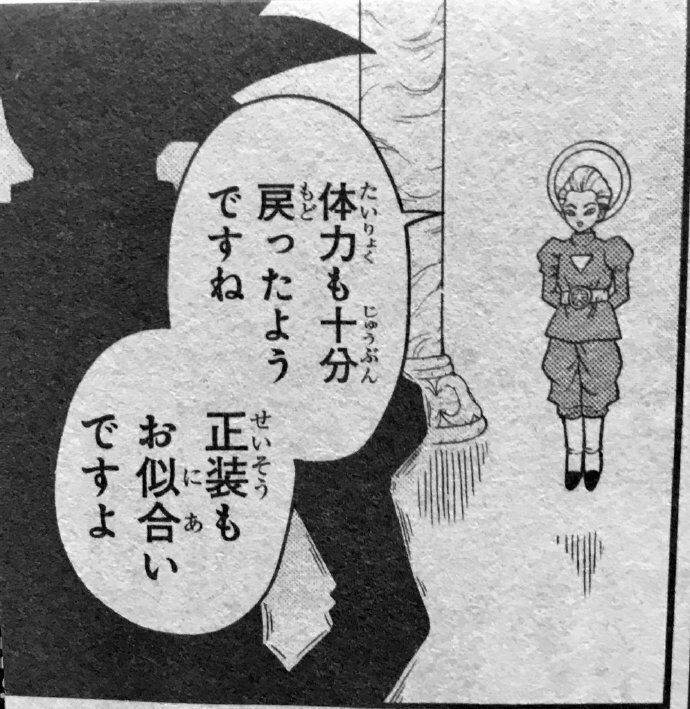 The uniform suits you too.” This development is really amazing as a lot of theories popped up when the Grand Priest was introduced. Everyone was talking about how Goku will become his student and become the omnipotent, etc. Well, apparently, one of the theory is going to become true but it’s still not canon as it is happening in Super Dragon Ball Heroes. Even then, I wouldn’t be surprised if Goku actually becomes his student to complete his Ultra Instinct. 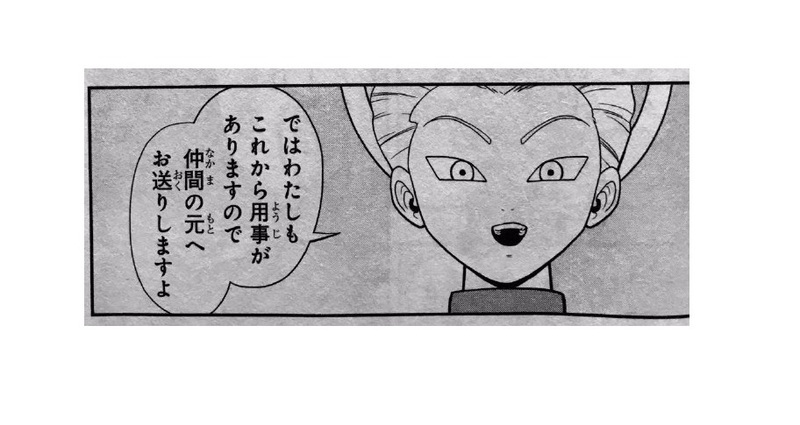 In the next panel, the Grand Priest says, “Well, then, from this point on I have my own business to take care of, so why don’t I return you to your friends…” I am really hoping that they show this in the next Super Dragon Ball Heroes episode 8 as there’s literally nothing else to show as they have covered everything else in the last episode.